What happens after reservation is made? Accommodation in Mali Losinj ! All events in place Mali Losinj ! Surface : 30 m2 (Ground floor). No. bedrooms: 1, No. of bathrooms: 1. Surface : 30 m2 (1. floor). Characteristics: Very close to the beach, by the sea, air-conditioned, idyllic location, with terrace. Other options: Pets are not allowed, heating, air conditioning. Price options: The use of air conditioners, included in the price per unit. One child under 2 years of age is free of charge per unit, with no claim to a bed or on board services. Tourist tax is included. Check in: 14:00 pm, Check out: 10:00 am. Prices are the total price for building / apartment on the day. Included are: utility fees in regular ratio of consumption (electricity, water, gas), weekly change of sheets and cleaning. For stays shorter than 4 days will be charged 30% add-on price. Registration is not included. Is 5 EUR per person (Single) Final cleaning not included in the price, an additional fee to be paid for final cleaning on departure from the accommodation. Losinj is a desirable tourist destination where you can find yourself again. The beginnings of tourism on the island Losinj are linked to health tourism as the benefits of climate and vegetation of the island first discovered by wise Austro-Hungarian aristocracy. 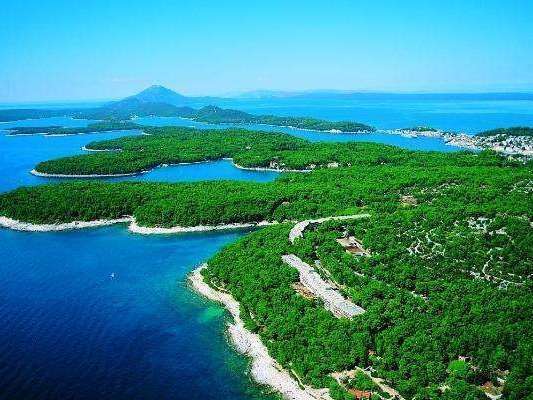 Except as Losinj declared a health resort, it was given to build a number of villas and cottages, which have been renovated, and now adorn Losinj. Their sequence and follow the newly-built hotels that are constantly enriched with new contents.Some of them are already proudly wear the label with a four-star hotel, offering the services of wellness centers and swimming pools with heated sea water, while others are converted into smaller family hotels and pensions. In private accommodation, you will have the opportunity to meet friendly locals - their customs, traditions. You will experience the symphony of colors, fragrances and flavors while enjoying the island, traditional cuisine based on wild, aromatic herbs and olive oil. Mali Losinj is the largest settlement on the island, situated on the south side of the bay Lošinj, and thanks to this position became an important maritime and trade, and today a tourist center. Located in Augusta Bay, the biggest closed bay of the island. From 6,500 inhabitants, Mali Losinj is today the largest city on the Adriatic island. The beginnings of Mali Lošinj back in the 12th century when it came to the island of Losinj twelve Croatian families settled in the eastern bay of St. Martin.The first Croatian settlers were farmers, later turned to fishing, marine and shipbuilding industry moved up and the whole village to shore. The golden age of Mali Lošinj was the end of the 19th century when, thanks to marine science, 'small village' has become a maritime town. Due to major changes and the maritime crisis in this area, graduating from sailing to steam, it seemed that the fate of these and similar towns sealed.Discovering the health benefits of the climate and the emergence of new industries, tourism, open a new page in the island's history. Mali Losinj is today a major tourist centers in Croatia, known in all European tourism circles, as evidenced by many loyal guests who visit it every year. Naval School "Ambroz Haračić" in the form of a boat with a conning tower building Maritime School, "Ambroz Haračić" in the form of a ship with the conning tower was built in 1975 in honor of the centuries-old tradition of training young sailors and Losinj long and glorious maritime past. Čikat-church of the Annunciation of the Blessed Virgin Mary (Annunziata). It was built in 1534th year and extended the 1858th year. At the point where it is received by the charter and seeing off the Losinj. Today, if a ship passing by Cape Annunzio, sounded sirens in greeting, she knows that the captain Lošinjanin. Church of St.. Martina from 1450 It is located in present-day cemetery, a place where you can read the history of Losinj. The priests who once served in this church were Glagolitic, in addition to the takeover and the role of the notary, and the assembled villagers wills, contracts, etc. Lošinjski marine education center - with multimedia and interactive screenings, exhibits and lectures can learn more about one valuable and the colony of dolphins that inhabit the center has a variety of courses and workshops that are very interesting, entertaining and extremely useful, especially to children when it comes to dolphins . Union priority field were analyzed in the time of the Romans, and is assumed to be close to any village and less about what we say remains of a Roman tomb - a necropolis. Garden - a nursery of medicinal plants in the island of Mali Losinj. With an expert guide, visitors can get acquainted with the rich flora of the island, the medicinal properties of plants and buy an original island souvenir. Susak is a small island located in the northern Adriatic near Losinj arhipelaga.Susak called the sandy island of brojinh shallow sandy bays of this island has. The island has no roads, no cars, no noisy nightclubs - just miles of dusty paths that cascades across the grassy village merged with the remote bays. During winter, the island has only a small number of suščana as most emigrated to America. Union is one of the most westerly islands in the Adriatic, in a series of smaller offshore islands: a rabbit, Srakane, Susak. The island is mountainous (highest peak Kalk, 138 m), built of limestone. Offshore Northwest coast is steep (Vele and Male rock), and the southwestern part of the peninsula field, with fertile soil, loess and potable water. Recently, field serves as a sports airport.Other parts of the islands are mostly covered with bushes and sometimes squalid, sometimes kultivranim land (mainly olive). Today, the Union Island, which has preserved the true nature and, thanks to the offshore location, extremely clean sea. In addition to locals, the island has recently come to live increasingly in love with its exceptional beauty. At the Union has no car traffic. . In our offer we have 5000 holiday apartments for rent across the Adriatic coast. Your deposit and transactions will always be secured with our secure payment system. For years we offering our users and guests best service over the internet. We assure you that our clients and partners offer only quality and approved accommodations !